Santa was a little late this year, but better late than never. 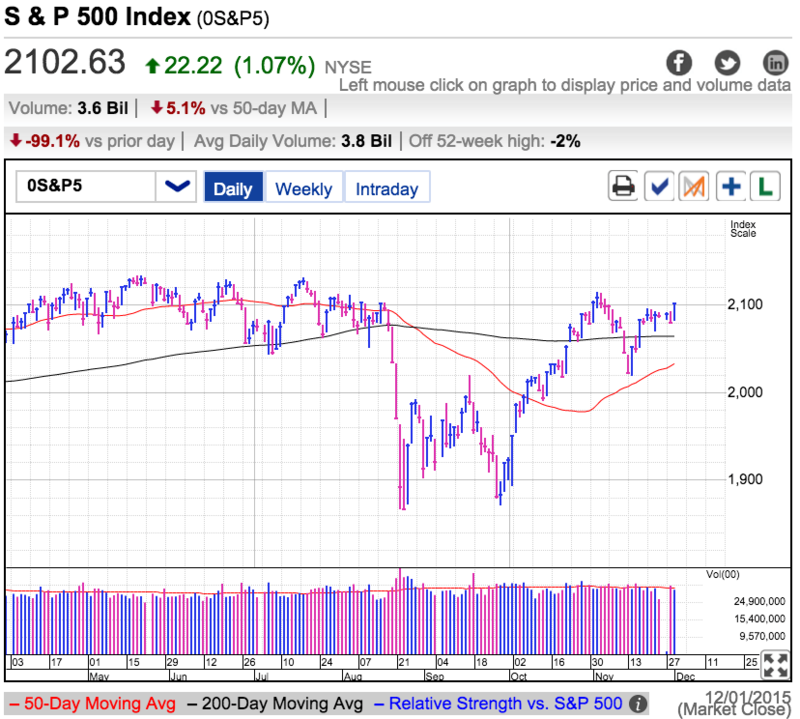 Tuesday the S&P500 finally reclaimed both the 50 and 200 day moving averages and is only three-percent from all-time highs. While it isn’t appropriate to draw long-term conclusions from this week’s light holiday trade, it is encouraging to see the path of least resistance is higher despite the relentless onslaught of ominous headlines. In a year where we’ve been given every excuse to sell off, this market has stubbornly hung in there. Since this will be my last post of 2015, I will share the 2016 outlook I wrote for Investing.com. What does 2016 hold for us? The best place to start looking for answers is in our past. Over the last 50-years the S&P 500 finished higher 78% of the time with a median gain of 18%. But what about those pesky off-years? The remaining 22% of the time we finished in the red, but with a more modest 10% median loss. These phenomenally favorable odds explain why the S&P 500 is up a staggering 10,800% over the last 50-years. Without anything else to go on, clearly the smart move is sticking with the market. But everyone wants to know if 2016 will be a typical year. Even though the S&P 500 is within a few percent of all-time highs, bearishness remains unusually elevated in most sentiment surveys. It seems the crowd is far more concerned about this six-year-old bull market than excited to embrace it. And who can blame them? Looking at the last 12-months of headlines, it is far easier to recall bearish stories because there were so many of them. But as a contrarian, the crowd’s cynical outlook is constructive because it means a lot of negative sentiment is already priced in. I fear markets that stop going up on good news, not ones that fail to sell off on bad news. Inevitably the news cycle will shift and we will stumble into a wave of positive headlines. The S&P 500 that struggled to move beyond 2,100 throughout 2015 will explode higher when these cynics are transformed into believers. While it is impossible to predict the surprises we will encounter over the next 366 days, given this sentiment skew and the fact we ran out of owners willing to sell bad news, the odds of a good year for US markets are even more favorable than the historical averages suggest. 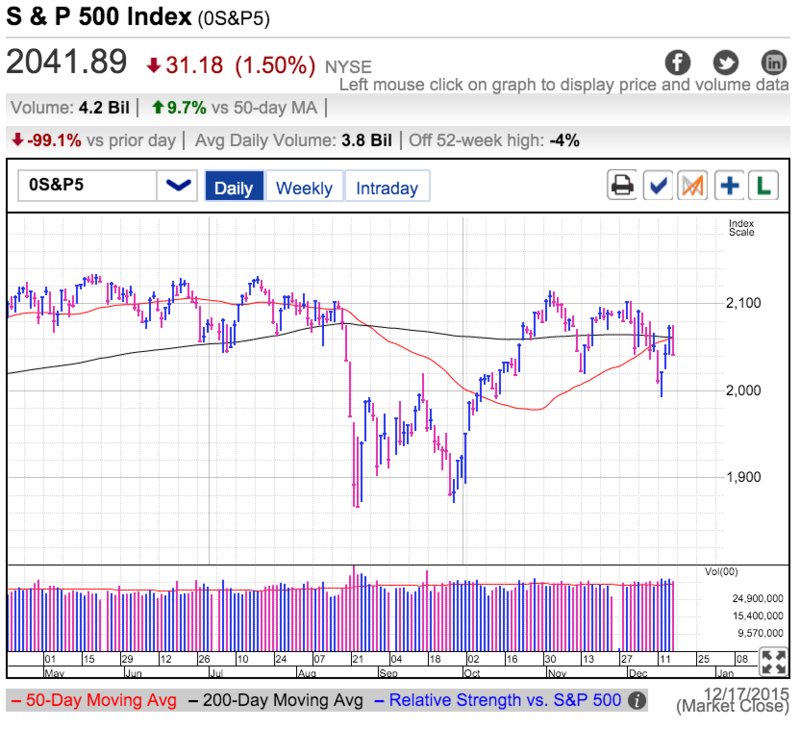 It was another good day for the S&P500 as it continued Monday’s rebound from 2,000 support. In typical fashion volume is trailing off as we approach the Christmas holiday. Since so many institutional money managers are on vacation over the next two-weeks, we cannot read too much into these daily gyrations because they are driven by “home gamers” overreacting to every move as if it is the next breakout/breakdown. It won’t be until January when we have the full force of the market giving us more meaningful data to interpret. That being said, it is constructive to see last week’s selloff stall and bounce at support. That reaffirms the lack of owners willing to emotionally react to every spooky headline or drop in price. No matter what the “experts” think we should do, if owners don’t sell, it is difficult to kickoff the much-anticipated correction. The longer this market refuses to breakdown, the more likely it is the next leg will be higher. It’s been a volatile week as three strong up-days were followed by Thursday’s sharp decline that unwound all of Wednesday’s Fed pop. Volume has been consistently above average as plenty of traders are participating in this pre-year-end tug-of-war. Between robust employment gains, rate hikes, falling oil, and a strong dollar, the market cannot decide on a direction. This leads to choppy trade where every apparent breakout/breakdown fizzles and reverses days later. The biggest driver of recent weakness is plunging oil prices that cannot find a bottom. Fears of a decimated energy sector and the resulting bond defaults are making equity traders nervous. But as spooky as the headlines feel, the stock market is far less bothered by these developments than the analysts and talking heads. While oil has been cut in half from its 52-week high, the S&P500 is down a far more palatable 4%. Even though it feels like we are in the middle of a protracted bear market, the actual evidence is far less convincing. This year we endured a near Grexit, Russian aggression, multiple acts of terrorism, Chinese stock market crash, global slowing, plunging oil, and a surging dollar. Looking only at the headlines, it’s been a horrible year. But somehow the equity market is down a modest 4% from all-time highs. Hardly the doom-and-gloom that most traders feel. Bears have been calling for a major selloff all year, but with only a couple of weeks left in 2015, they are starting to look more like Chicken Littles than insightful and savvy speculators. The biggest thing working against bears at this point is everyone is well aware of their investment thesis. That means anyone who agrees with them has been given plenty of time to sell and as a result, the current crop of owners are not bothered by these prognostications of doom-and-gloom. No matter what the market is “supposed to do”, when no one sells the news, it is really hard to trigger a major selloff. In fact as a contrarian I take the opposite view. If these dire headlines cannot dent this market, just imagine what will happen when it actually stumbles across the inevitable piece of good news? Disagree with this market at your peril. Thursday was the first up-day this week as the S&P500 struggles to resist oil’s slide to multi-year lows. But “up-day” is a relative term since we only finished four-points to the positive following three-days of losses that shed more than 40-points. Today’s volume was the weakest since we topped a couple of weeks ago. But even more ominous was the lethargic intraday trade over the last-two sessions where early strength fizzled and we closed near the lows. If this market was oversold and poised to launch higher, early strength would have sent us on our way. It is hard to be constructive when every rebound is overwhelmed by another wave of selling. Oil has been in a nearly one-way selloff since early October. While everyone has largely been aware of the low oil prices, concern didn’t get acute until Monday when we broke under $40 for the first time in seven-years. This development moved oil prices from the commodity page to the front-page. In Tuesday night’s post I wrote about how nonsensical it was for the market to lose its mind as oil went from down 60% to down 63%. Really? We can handle a $60 drop, but $63 is just too much for the market to bear? How much more damage can another $5 or $10 fall do when we already shed $60 over the last year and some? Previously there was a legitimate argument that falling oil prices was due to a weakening economy and dropping demand. While there is a nugget of truth here as the global economy slows, it is becoming increasingly obvious that oil’s biggest problem is supply, not demand. The lower oil prices fall, the more producers are forced to pump to compensate for the lower prices. This isn’t a consumption problem, it is a structural problem for an industry with high capital expenditures and low operating costs. With pumping prices around $20 per barrel, producers are incentivized to pump as much as they can even at $37 per barrel. And this line of thought played out at last week’s OPEC meeting where the group failed to agree to production limits to prop up prices. All of this means equities tight correlation to oil prices this week is total B.S. If financial contagion, multiple acts of terror, a plunging Chinese stock market, and all the other bearish headlines we survived this year, should we really fear another $5 dip in oil? But this is the logical argument and it often takes the market time to come around to the obvious answer. Given the awful way we traded this week, that appears to be the case. There is no merit to this selloff, but that doesn’t stop reactive and emotional sellers from joining the herd. But I cannot complain too loudly because without the crowd’s irrational trading decisions, it would be far harder to make money. If people want to sell me perfectly good stocks at a discount, who am I to argue with them? While this dip is buyable, we are not quite there yet. Wednesday’s and Thursday’s weak trade tells me there is a little more downside before we reach a capitulation bottom. We are hovering so close to recent lows that a dip under these levels is almost inevitable. If we break support and rebound sharply on high volume, that will be our sign the fever has broken and we can jump back in. Of course the next major headline is the Fed meeting next week, but I’ll save that analysis for next time. 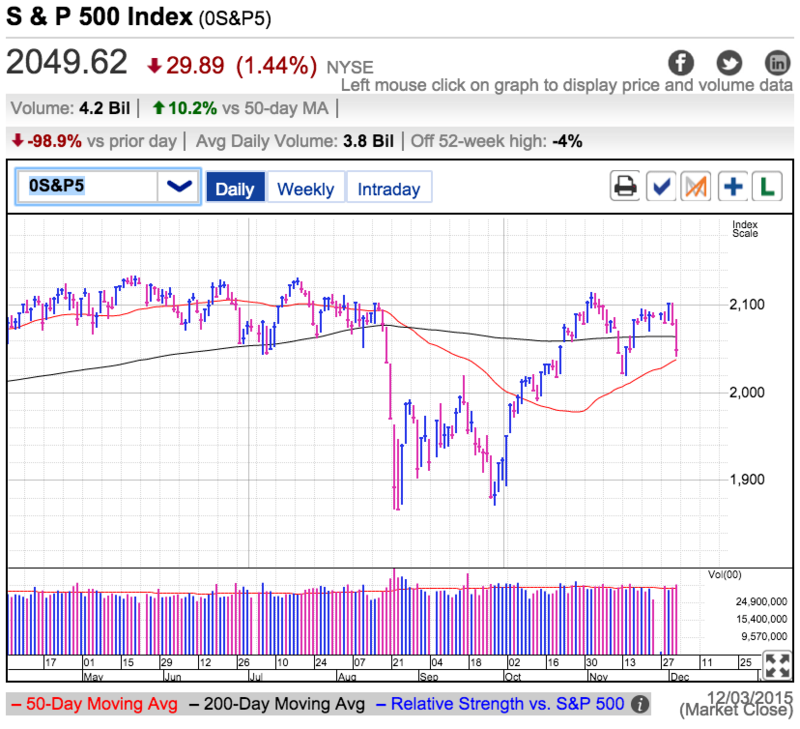 The S&P500 dropped another dozen-points Tuesday as obsession over weak oil prices continued for a second day. Volume was above average on this fourth-downday out of the last five-trading sessions. But as much red as we’ve seen, we remain within a few percent of all-time highs. Clearly there is a disconnect here, but who is getting it wrong, the bulls or the bears? Oil fell $3 over the last two-days and is under $40 for the first time in seven-years. We’ve been hearing for months how a strong dollar and weak energy prices would crush this market and over the last two-days that is exactly what happened. But was this weakness just the start of something far larger, or a feeble knee-jerk reaction to a headline? While it is impossible to come to the market without a bias, let’s try to put them aside for a moment and look at the facts. Many people are currently predicting a large selloff in the broad market following this $3 drop in oil. Does this outlook stand up to the facts? If we take a step back and review a two-year chart, we will see oil has fallen more than $60 over that time. The bulk occurring in 2014 when the stock market notched a 13% gain. If a $60 plunge in oil failed to crush the equity market, what are the chances this $3 selloff will do it? Clearly the market is in a half-full mood at is obsesses over everything that is wrong. Weak oil prices mean plunging energy sector profits. The strong dollar is crushing US exporters. That is the story we hear repeated day in and day out. What no one is talking about is the benefits of low oil and a strong dollar. For every loser there is a winner and this situation is no different. Two-dollar gasoline is the same thing as sending a $2,000 stimulus check to the average family. (2 cars x $2 per gal x 12,000 mi / 25 mpg = $1,920) The strong dollar? While that hurts domestic exporters, it is a boon to companies that rely on foreign inputs. Anyone that buys products, parts, and materials from overseas is going to see those discounts flow straight to the bottom-line. Where are all the people talking about the positives of weak commodity prices and a strong dollar? Back in the booming 90’s oil was $15/bbl and 80-cents could buy a Euro. Last time I checked, the 90s were a pretty darn good time to own stocks. While this fear of weak commodities and a strong dollar is clearly misguided, as traders we have to trade the market we are given. It is foolish to sell these headlines, but that doesn’t prevent the emotional and impulsive from making poor trading decisions. And to be brutally honest, all our profits come from these people so we cannot be too quick to criticize them. But even when we are right, we can still get run over by the crowd so we have to be careful here. 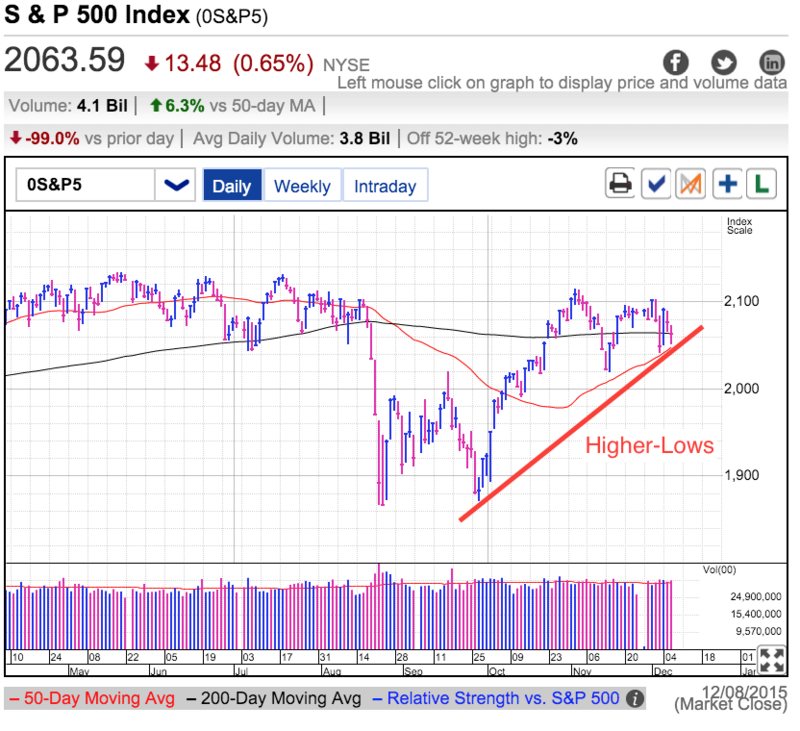 The market continues making higher-lows as it recovers from the Fall correction. While this is constructive, we need to be wary of a drop under last week’s lows. That could trigger a wave of stop-loss and reactive selling, pushing us back down to 2,000 support. But if we hold these levels, expect this nervousness to evaporate and position yourself for the Santa Claus rally. If you want more check, out our premium subscription that delivers this analysis every day during market hours. It was another brutal day for the market. The S&P500 extended Wednesday’s selloff, erasing well over 50-points across these two sessions. Volume was the highest we’ve seen since we were stuck in the throws of November’s pullback. Yesterday Janet Yellen rained on the bull’s parade. Today it was Mario Draghi’s turn. While the European Central Bank expanded its easy money policy, it didn’t go as far as many traders were hoping. That sent European markets plunging over 3%. The sour mood quickly spread to US markets where we embarked on a relentless sympathy selloff that eroded prices throughout the day. Given the dreadful headlines and all-consuming uncertainty, we found ourselves with an oversupply of nervous owners desperate to get out, but few buyers willing to step in front of this mess. The nearly nonexistent demand meant sellers had to continue offering lower and lower prices to attract buyers. But in a vicious cycle, those discounts convinced even more owners that they needed to get out. This downward spiral didn’t stop until the closing bell saved us. Today most sellers embraced a “sell first, ask questions later” risk management strategy. The reason I know this is because nothing changed economically between today and last week. We find ourselves inside a frustratingly slow economic recovery with repressed energy prices, a strong dollar, and a looming Fed rate hikes. Just like last week, and last month. If the fundamentals didn’t change traders’ outlook, then it had to be something else. Few things are more contagious than fear. When confident owners watched the value of their account drain as everyone else hit the sell button, they lost their nerve and joined the herd. The unfortunate thing is the market has a nasty habit of humiliating reactive traders. It almost has a sixth-sense for knowing exactly where our pressure points are and pushes us one inch beyond them. Rather than reward a reactive seller by allowing him to escape a far larger selloff, most often the market adds insult to injury by rebounding as soon as the emotional seller finishes giving away his stock at steep discount. The looming fear is what if Friday’s Jobs Report adds more fuel to the selloff. While that is a real possibility, successfully trading is a game of playing odds. We know the vast majority of stock owners are indifferent to these minor gyrations. They are the blissfully ignorant 401k investor or the large institution that is so ginormous they cannot dance around these daily price swings. That means most of this daily volatility is driven by the small segment of active traders. The thing about active traders is while they throw their weight around with great effect, they don’t have a lot of ammunition. Once they jump from one side of the market to the other, they used up the only vote they get and it takes a new trader to keep a move going. As awful as today feels, lets not forget we are only 4% from all-time highs. This is still a long way from waking up the oblivious masses who rarely look at their brokerage statements. If today’s selloff is just another hysterical move driven by overly active traders, it will stall and reverse as quickly as every other “fearful” selloff we’ve endured this year. The scarier it feels, the closer we are to the bottom. 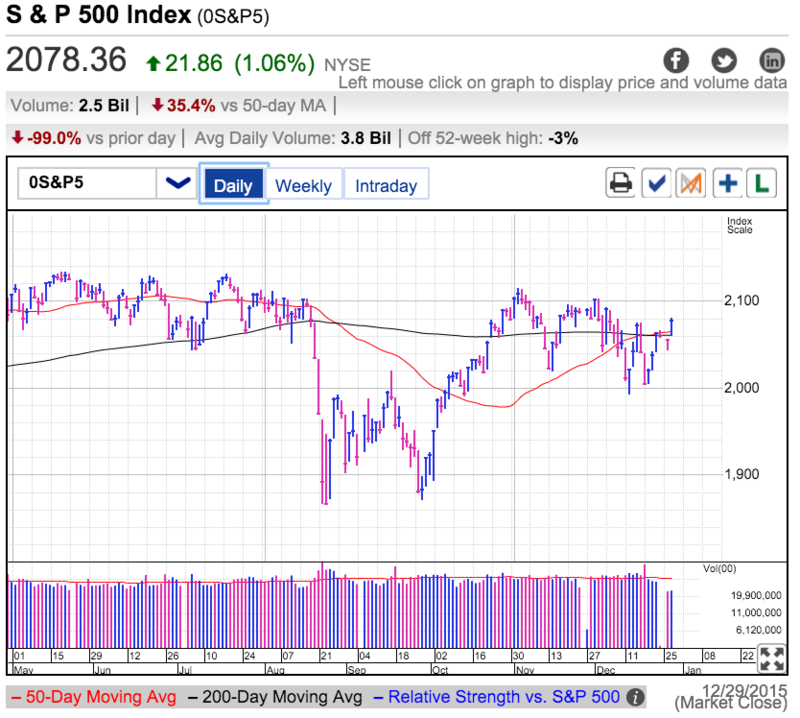 The S&P500 finally climbed through 2,100 resistance Tuesday on below average volume. The last time we found ourselves this high, the rebound stalled the next day and we tumbled back to the low 2,000s. Will this time be any different? It was hard to identify a bullish catalyst that fueled these gains. The biggest headline was a disappointing manufacturing report showing the first contraction since 2012. If we put our “inverse-logic” hat on, maybe traders were hopeful this revelation would further delay the Fed’s impending rate-hike. But that wishfulness is a stretch since the Fed already recognized a stronger dollar and slowing global growth would pressure exports. If traders were buying this headline, they were grasping at straws. The most likely explanation is the one I’ve been talking about for weeks. It is getting harder and harder to find owners willing to sell their stocks regardless of the headlines. If terrorism and a NATO nation doing a Russian jet won’t spook stock owners, are one or two points on a manufacturing report going to make a difference? Given today’s price-action, apparently not. While we have countless reasons to sell-off, it is far more insightful to look at the market’s response to these bearish headlines. Rather than argue with the market and demand it go lower, we should acknowledge this uncanny strength in spite of the bad news. If we are open-minded enough to listen, the market is telling us it isn’t bothered by these widely known issues because they are already priced in. While a stubborn trader refuses to believe bad-news could be priced in near all-time highs, what he is failing to account for is where we would be without these economic and political headwinds. 2015 has largely been a bust because we are trading at the same levels the year started at. This is in comparison to the nearly 20% yearly gains we’ve averaged over the last six-years. If we continued to receive positive economic news throughout the year, there is every reason to expect we would trading near 2,500. That means slowing global growth, a strong dollar, slumping energy prices, and a sluggish US recovery have already taken 400-points out of our market. It’s been a bumpy ride this Fall as we digested these headlines. Over the last four-months, nervous traders have been given plenty of excuses and opportunities to bail out. If the headlines didn’t scare them out, then no doubt the plunging prices did. But just as things looked their worst, we bounced. This recovery wasn’t driven by good news, it came from running out of sellers. Anyone who wanted to get out sold their stock at a steep discount to a far more courageous dip-buyer who demonstrated a clear willingness to hold these risks. Flushing out weak owners and replacing them with confident ones is what solid bases are built on. These new owners bought when the hysteria was at its worst, so it shouldn’t surprise us when they shrug off far more trivial headlines. As long as they remain confident, supply stays tight and prices continue defying “logic”. Don’t think about what the market should do, figure out what other traders are thinking and trade the resulting supply and demand. Strength in the face of bad news is extraordinarily bullish and only a fool would argue with this market.